When it comes to expensive organic produce, I don’t like to waste a single scrap. If you have a compost pile, you can always put your fruit and veggie scraps there. Otherwise, I’ve come up with a few solutions to maximize every inch of your plants. With my veggie scraps—which include items like carrot tops and kale ribs—I like to make my own veggie stock. You can read more about how I collect and transform the scraps under Basic Formulas. Coming up with an edible use for fruit scraps—peels, cores, pits, etc.—has proved much more difficult. I was reminded of a time that I visited a candy factory in France. The chocolatiers had candied orange peels and they were pretty tasty. I figure I can experiment with candying other types of peels, but being that I like to keep my lifestyle low in added sugars, I’m not eager to do this any time soon. I decided to go another route. My husband bought me a bouquet of winter plants on Christmas Eve and we thought that it would be neat to do something with the pine needles since they smelled so wonderful. We researched online how to make scented oil candles and then it hit me: If I could make candles out of pine needles, flowers, and herbs, why couldn’t I use my fruit scraps to do the same? Alas, I started deliberately saving my fruit scraps (while still allocating many of them to my compost pile in the backyard). I placed a food storage container in the fridge and added to it every time I peeled or cored a new fruit. It took me only a couple of hours to accumulate the scraps that you see here, which include peels from oranges, lemons, grapefruit, kiwis, and mangoes, and the core of a Red Delicious apple. There was no rhyme or reason to this combination of scraps and a happy aromatic accident resulted. While my fruit scraps continued to marry their flavors in the fridge, I collected the necessary candle-making supplies: mason jars, oil wicks, and vegetable oil. 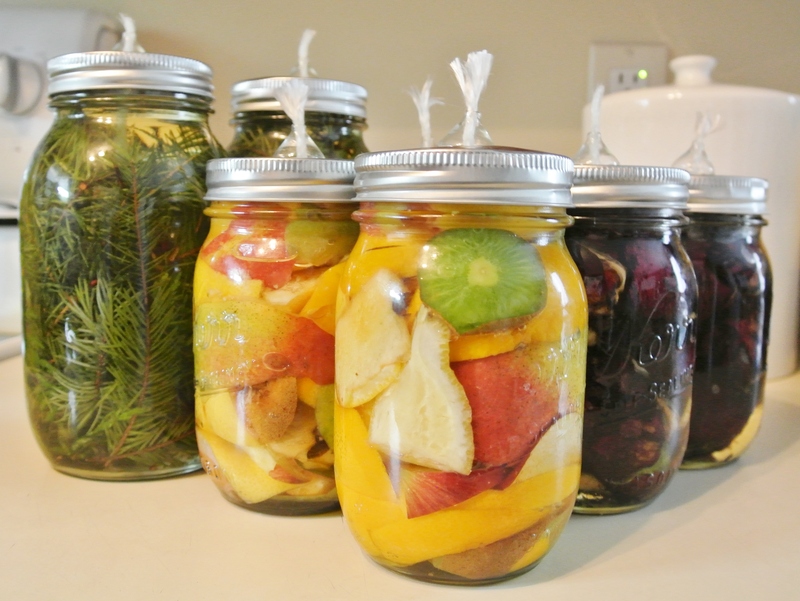 I already had mason jars in several sizes, and you can find them many places, including the dollar store. For the wicks, I perused Amazon and found these pretty glass wicks; they are available in many metal varieties, too. 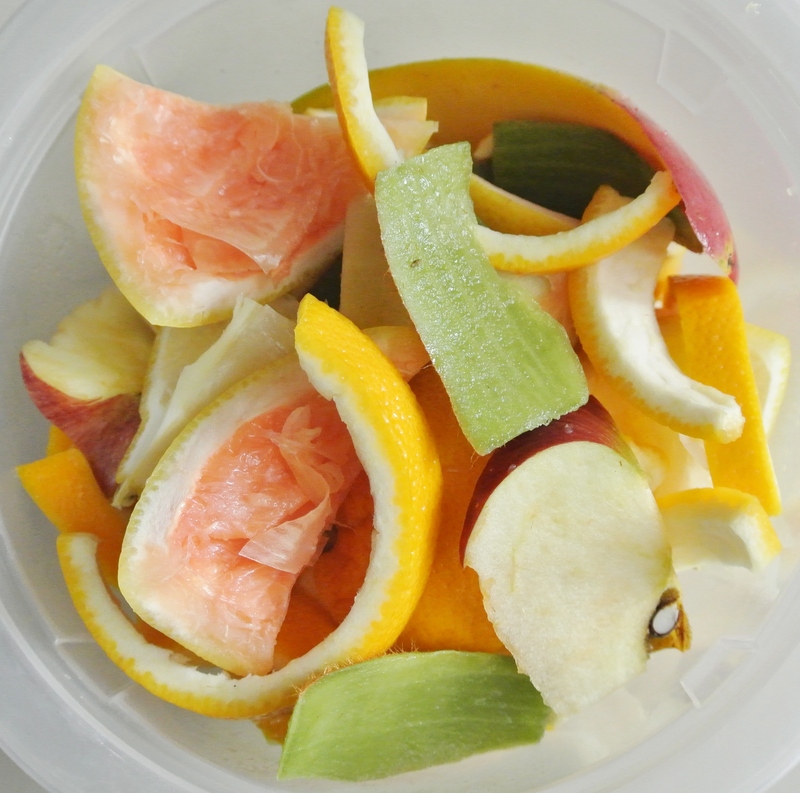 Fruit scraps of any variety (accumulate in the fridge over the course of a day or two) –> I’m using citrus, kiwi, mango, and apple. Oil –> I’m using vegetable. Oil wicks –> You can make your own or purchase in store or online. I’m using wicks with a glass covering. Puncture a hole in the lid of your mason jar. The size will depend on the type of wick that you are using. 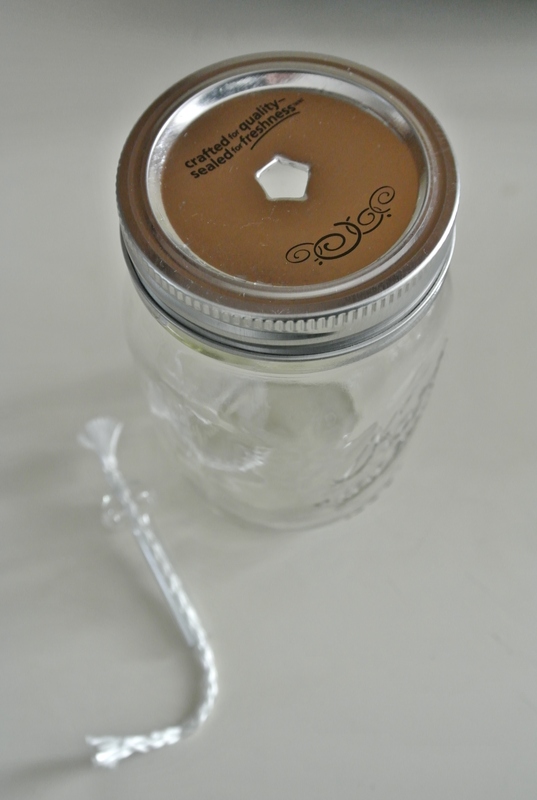 The lid of a mason jar is easy to puncture with just a screwdriver or other metal tool with a semi-sharp tip. 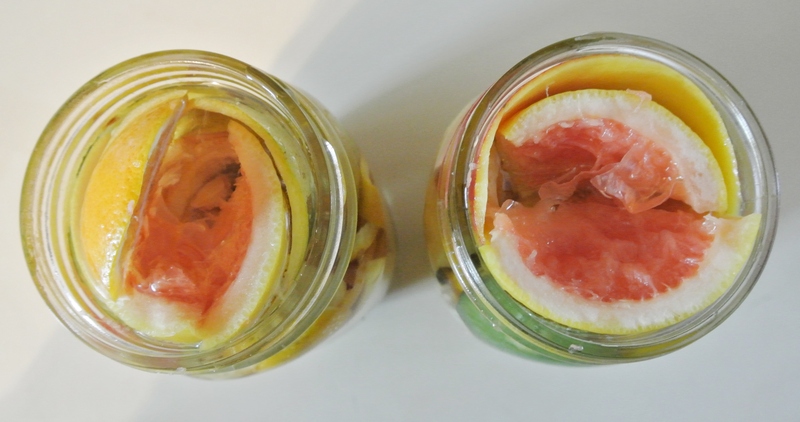 Fill the mason jar with your fruit scraps. Cram them in tightly, leaving a small gap in the middle to accommodate your wick. You can arrange them with your fingers or a variety of different kitchen tools. I squished the scraps down with an ice cream scoop myself. Fill the remaining space in the mason jar with oil. Keep in mind that you will need to add the wick, so don’t fill it quite to the brim. Thread your wick through the hole you created in the lid and gently push the end of it into the candle itself. I used a skewer to do this. 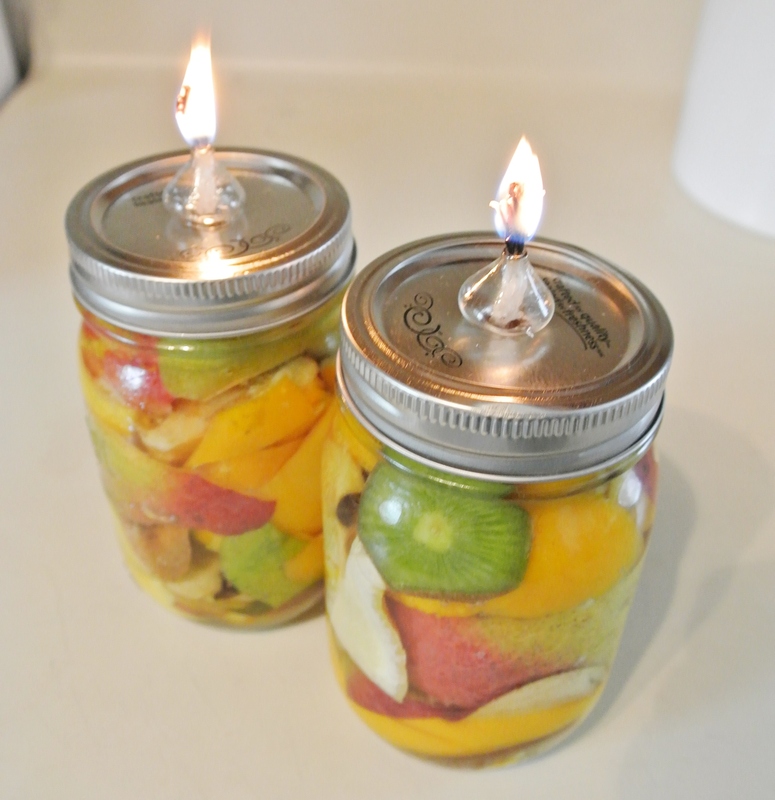 Screw on the lid and wait an hour or two for the wick to absorb the oil before lighting. Don’t expect the candles to be immediately scented, although it could happen. Here, you can see my fruit scrap candles front and center, as well as the pine needle candles mentioned earlier, and some red rose candles made from dried roses from the hubby. Fresh would have been better, but I didn’t have this oil candle brainchild until long after they had been dried over the years. You can intensify and expedite the scent experience by adding complimentary essential oils (you can purchase these in many places that sell candles, oil burners, etc. ), which I did with the roses since they weren’t fresh. Enjoy! My question is how does the fruit stay fresh looking in there? Do you think if I add wax it would make a difference ?